The world population is increasing day-by-day. Currently, it is considered nearly 7 billion. Some theories suggest that by the year 2050, the global population will reach to 9 billion, and during 2100, it could be 20 billion. Lack of food and deterioration in human health will be burning issue due to the population growth and urbanization, with a concomitant reduction in arable land. To address global food demand (especially protein) can be converted into lingo-cellulosic agricultural and forest residues into protein-rich mushrooms is one of the most economically viable and sustainable biotechnology processes. Utilization of edible fungi to fulfil human nutritional rights has been a common denominator in the history of humankind., Penicillin, perhaps the most famous of all antibiotic drugs, is derived from a common fungus called Penicillium. Many other fungi also produce antibiotic substances, which are now widely used to control diseases in human and animal populations. The discovery of antibiotics revolutionized healthcare worldwide. Some fungi which parasitize caterpillars have also been conventionally used as medicines. Agaricus bisporus (A. bisporus) Imbach is the most wild and cultivated edible mushroom and represents more than 40% of the world bearing of mushrooms., It is cultivated in over 70 countries and on every ascetic, except Antarctica. The global production in the 1990s was more than $800 million/year  and increased to $12,250 in 2002 (UN 2010). A. bisporus has a luscious taste with more nutritional value has very good aroma or flavoring taste is used as food and in food industries. It is considered to have high biological activity, low toxicity and has significance folklore and ethanopharmacological significance. Apart from food and food beverages it has a role in perfumery, cosmetic industries and pharmaceutical industries., Wild A. bisporus were referred for customer due to their flavor and texture. It has been reported lots of primary and secondary metabolites responsible for the therapeutic activity for the prevention and treatment of many diseases such as cancer, hyperlipidemia, microbial diseases, cardiovascular problems, liver diseases, and immune problems. A. bisporus is a litter degrading basidiomycete commonly found in humic-rich environments which are useful as a model organism and cultivated in large scale for the food industry. Due to its ecological niche, it produces a variety of enzymes for detoxification and degradation of humified plant litter. A. bisporus is an edible basidiomycete mushroom native to grasslands in Europe and North America. Commonly known as white button mushroom (WBM), is widely cultivated in most countries and it constitutes the bulk of all mushrooms consumed in the United States and Australia. Historical evidence indicates that it was first cultivated in France and that cultivar strains originated in Western Europe.,, Ancient Egyptians believed mushrooms could grant immortality and thus, only the pharaohs were deemed worthy of eating or even touching them. In ancient Rome, mushrooms were often referred to as “food for the gods.” In Russia, China, and Mexico, and other world cultures, folklore held that mushrooms conferred superhuman strength. Conventionally, the fungus was used in the treatment of cancer, cerebral stroke, and heart diseases. Furthermore, it has anti-aging property. They represent as one of the world's greatest untapped resources of nutrition and palatable food of the future. Mushrooms have been found to be more effective against cancer, cholesterol reduction, stress, insomnia, asthma, allergies, and diabetes. They can be used to bridge the protein malnutrition gap because they have a high amount of protein. Mushrooms are useful to increase the immunity. Hence, it provides a nutrient supplement as a form of tablets. They are also useful for diabetic and patients with cardiovascular disorders (because they contain low starch and low cholesterol). One-third of the iron in the mushrooms is available in free form. Their polysaccharide content is used as an anticancer drug and combat HIV effectively., Biologically active compounds from the mushrooms possess antifungal, antibacterial, antioxidant, and antiviral properties, and have been used as insecticides and nematicides as well. There have been studies that demonstrate that women who eat these button mushrooms daily have reduced chances of getting breast cancer. The mushrooms can be thought to inhibit the production of enzymes that affect the production of estrogen which is a hormone that causes cancer to develop. The special effects of this substance on other kinds of cancer are still being studied. A young fungus either light-yellow or light-brown in color with an abutted cap, known as common mushroom, white mushroom or button mushroom. In strains with darker flesh, the premature mushroom is variously marketed as cremini mushroom, baby bella, Mini bella, roman mushroom, Italian mushroom or brown mushroom. Original cap is a pale gray-brown, with extensive, horizontal scales on a paler background and fading toward the margins. It is first hemispherical in shape before flattening out with maturity and 5–10 cm (2–4 inches) in diameter. The precise, crowded gills are free and initially pink, then red-brown and finally a dark brown with a whitish edge from the cheilocystidia. The cylindrical stipe is up to 6 cm tall by 1-2 cm wide and bears a thick and narrow ring, which may be streaked on the upper side. The firm flesh is white, although stains a pale pinkish-red on bruising. The spore print is dark brown. The spores are oval to round and measure approximately 4.5–5.5 × 5–7.5 μm. Mushrooms are considered as a heterotrophic and have no chlorophyll. Scientific confession of the commercial cultivation of A. bisporous was made by French botanist Joseph Pitton de Tournefort in 1707. French agriculturist Olivier de Serres seen that transplanting mushroom mycelia would lead to the propagation of more mushrooms. Originally, cultivation was capricious as mushroom growers would watch for good flushes of mushrooms in fields before digging up the mycelium and replanting them in beds of composted manure or inoculating “bricks” of compressed litter, loam, and manure. Spawn collected this way usually contained pathogens and commonly crops would be infected or not grow at all. In 1893, pure culture, spawn was discovered and produced by the Pasteur Institute in Paris, for cultivation on composted horse dung. The substrate for culturing A. bisporous is the most complicated culture medium used for edible mushroom production. The compost is prepared by a two-stage mechanism. In the first stage, a mixture of raw materials, animal manure (such as stable bedding or poultry manure) and gypsum are assembled, wetted and formed into a stack (windrow). The cultivation of this species have succeeded on different composted organic such as chicken, horse or pigeon manures, straw residues from wheat, oat, tifton, reed crops,, corn cob, molasses, wheat bran, sugarcane bagasse, tea levaves, brachiaria, reed plant (Phragmites australis) straw, water hyacinth (Eichhornia crassipes), and others. Wheat straw with waste tea leaves , and waste paper was used in the casing layer. Water inclusion is controlled, and the stack is dissembled and reformed at intervals. In the second stage, pasteurization is done to brace the compost for a selective growth medium on which A. bisporus has been inoculated. This two-phase process for substrate preparation has some demerits, Such as more time and space required for cultivation.,,, Automated harvesting of A. bisporous by machine at the laboratory level; and the resulting pilot harvester was completely tested on a commercial mushroom farm. The apparatus associates various handling systems and mechatronic technologies. Mushrooms are located and sized using image analysis and a monochromatic vision system. An expert selection algorithm then decides the order in which they should be picked and selection of picking action (bend, twist or both)., One of a pair of suction cup mechanisms attached to the single head of a Cartesian robot is then deployed, which can delicately detach individual mushrooms and place them gently into a specially designed, compliant finger conveyer. After high-speed skiving, a gripper mechanism is finally used to remove mushrooms from the conveyor into packs at the side of the machine. Abou-Heilah et al. reported potassium and sodium concentration was 300 and 28.2 parts per million, respectively. The ash analysis revealed the high amount of K, P, Cu, and Fe.A. bisporus contains Ca (0.04 g), Mg (0.16 g), P (0.75 g), Fe (7.8 g), Cu (9.4 mg), Mn (0.833 mg) and Zn (8.6 mg) per kilogram fresh weight. 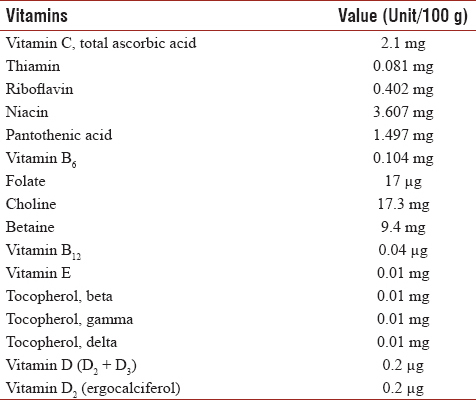 Various constituents, microelements, and vitamins present which is shown in [Table 1], [Table 2], [Table 3]. Polysaccharides reported in A. bisporus had a good amount of “a” and “b” glucans which was confirmed by Fourier-transform infrared spectroscopy (FTIR) and were found to have immune stimulating effect. A total of 240 seven-day old mix sexes quail chicks were randomly allocated to four experimental groups treated with the A. bisporus then old male and female chicks were separated at 21 days. Birds were allowed to free to take water and feed at the time of the 35 days of the growth period. Total cholesterol (TC), triglyceride (TG) and low-density lipoprotein (LDL) were found to be significantly decreased compared to the control. HDL cholesterol was significantly increased with 2% mushroom compared to the control so in conclusion 2% mushroom positively affects cholesterol, TG, high-density lipoprotein (HDL), and LDL of quails diet. A. bisporus is effective in case of breast cancer because it decreases aromatase enzyme activity and estrogen biosynthesis. The researcher evaluated the activity of mushroom extracts in the estrogen receptor-positive/aromatase-positive and found to have decreased testosterone-induced cell proliferation in MCF-7aro cells but had no effect on MCF-10A, a nontumorigenic cell line. The objective of this study was to examine the hypothesis that intake of the fruiting bodies of WBM regulates antiglycemic responses. For these studies the rats were fed hypercholesterolemic diet and type 2 diabetes induced by injection of streptozotocin for 3 weeks in rats. The result allowed reduced plasma glucose, TG concentrations, liver enzyme activities, alanine aminotransferase and aspartate aminotransferase. In hypercholesterolemic rats, oral feeding of ABP for 4 weeks resulted in a significant decrease in plasma TC, LDL, and concluded that A bisporus had both hypoglycemic and hypolipidemic activity in rats. The anti-inflammatory activity of methanolic extracts of A. bisporus was investigated on activated macrophages and found that some edible mushrooms species have a potential anti-infl amatory capacity in vitro. In such a study (pilot) evaluation of bioavailability of ET in healthy men (n = 10), using a randomized, cross-over, dose-response, postprandial time-course design, conducted at the General Clinical Research Center at Pennsylvania State University in 2009. ET was administered with mushroom powder. Postprandial red blood cell concentrations of ET and plasma glucose, TGs, HDL, LDL and TC were also monitored. Biomarkers of inflammation and oxidative stress were evaluated using C-reactive protein and oxygen radical absorbance capacity (total). ET from A. bisporus mushrooms is bioavailable as assessed using red blood cell uptake postprandial, and consumption is associated with an attenuated postprandial TG response. In this study, in vitro supplementation with A. bisporus on the maturation of bone marrow-derived dendritic cell (BMDC) of C57BL mice and found that dose-dependently increased expression of maturation markers CD40, CD80, CD86, and major histocompatibility complex-II. A. bisporus contain a group of benzoquinone which belongs to antibiotics group and tyrosinase enzyme which was isolated from this species is completely resemble human tyrosinase which is very beneficial in field of cosmetics. Kawakami et al., reported the intestinal fermentation of A. bisporus in rats. It was proved by physical examination of animals by bacterial and HPLC analysis of cecal content and concluded that the mushrooms powder have a beneficial effect on the intestine. This investigation was based on an effect of purified tyrosinase from A. bisporus on B16F10 melanocytes for the melanin production through blocking pigment cell machinery. Using B16F10 melanocytes showed that the stimulation of melanogenesis by purified tyrosinase is due to increased tyrosinase absorption. Cellular tyrosinase activity and melanin content in B16F10 melanocytes were increased by purified tyrosinase in a dose-dependent manner. The results indicated that purified tyrosinase can be treated as a contestant for the treatment of vitiligous skin conditions. Komura et al. proved the anti-inflammatory and antinociceptive effects of fucogalactans, fucomannogalactans, and mannogalactans isolated from Agaricus brasiliensis and A. bisporus var. hortensis. The study involved isolating Erwinia spp. and Ralstonia solanacearum from infected plants followed by subjecting the isolates and commercially acquired Staphylococcus aureus (ATCC 25923), Enterococcus faecalis (ATCC 29212), Escherichia More Details coli (ATCC 25922), Pseudomonas aeruginosa (ATCC 27853), Streptococcus pneumoniae (ATCC 49617), Proteus vulgaris (ATCC 49990), Candida albicans, Aspergillus niger (ATCC 1015), Fusarium oxysporum (ATCC 16608), Ustilago maydis (ATCC 14826), Microsporum gypseum (ATCC 15621), and Malassezia furfur (ATCC 14423) and were successfully antagonized by mushroom. Owaid et al., developed the methanolic nanoparticles of A. bisporus have various advantages to treat cancer, viral, bacterial, fungal diseases, etc., This type of the nanoparticle synthesis by edible and medicinal mushrooms are economic and suitable to apply in nanomedicine due to the huge number of fruiting bodies which are produced in the world.,, The commercial mushroom production process is usually performed in buildings or tunnels under highly controlled environmental conditions. In nature, the basidiomycete A. bisporus has a significant impact on the carbon cycle in terrestrial ecosystems as a saprotrophic decayer of leaf litter. Emerging evidence from exciting new studies suggests that mushrooms may also help to:	boost energy, eliminate fatigue and balance the effects of stress, promote healthy skin and hair,	cleanse the liver and flush out toxins, improve brain cell function and promote memory and concentration on the basis of various constituents present in the A. bisporus. We can conclude about the diverse benefits of mushrooms towards humans by the words of the father of medicine that is, Hippocrates “Let food be your medicine and medicine be your food.” This saying applies suits mushrooms, as they have tremendous medicinal food, drug, and mineral values. Hence, they are a valuable asset for the welfare of humans. A. bisporus may be used to cure various diseases in future and play a key role or like a backbone in the research field. They are small plants but treasures major qualities which act as a key principle for various researches applicable to pharmacology, pharmacognosy, microbiology and biotechnology. The author would like to express his hearty thanks Mrs. Garima A Tiwari, Sr. Assistant Professor, Department of Pharmacy, BBD University for necessary corrections and advises; Central Drug Research Institute, Lucknow for providing library facilities to access the journals and books and made this review possible. Livi-Bacci MA. Concise History of World Population. 5th ed. Malden (MA): Wiley-Blackwell; 2012. p. 50. Hawksworth DL. The fungal dimension of biodiversity: Magnitude, significance, and conservation. Mycol Res 1991;95:641-55. Chang ST. The world mushroom industry: Trends and technological development. Int J Med Mushrooms 2006;8:297-314. Singha R, Bishnoi DK, Singh A. Cost benefit analysis and marketing of mushroom in Haryana. Agric Econ Res Rev 2010;23:165-71. Thakur MP, Singh HK. Advances in the cultivation technology of tropical mushrooms in India. JNKVV Res J 2014;48:120-35. Callac P, Imbernon M, Guinberteau J. Discovery of a wild Mediterranean population of Agaricus bisporus, and its usefulness for breeding work. Mushroom Sci 2000;15:245-52. Carluccio A. Complete Mushroom Book: The Quiet Hunt. London: Quadrille Publishing Ltd; 2003.p. 21-2. Andersson HC, Gry J. Phenyl Hydrazines in the Cultivated Mushroom Agaricus bisporus Occurrence, Biological Properties, Risk Assessment and Recommendations. Nordic Council of Ministers, Copenhagen. Tema Nord 558, Ekspressen Tryk & Kopicenter; 2004. p. 1-123. Misharina TA, Mukhutdinova SM, Zharikova GG, Terenina MB, Krikunova NI, Medvedeva IB, et al. Formation of flavor of dry champignons (Agaricus bisporus). Prikl Biokhim Mikrobiol 2010;46:119-24. Caglarırmak N. Determination of nutrients and volatile constituents of Agaricus bisporus (brown) at different stages. J Sci Food Agric 2009;89:634-8. Dastager SG. Aroma compounds. In: Nigam PS, Pandey A, editors. Biotechnology for Agro-Industrial Residues Utilization. Kerala, India: Springer; 2009. p. 105-27. Sadiq S, Bhatti NH, Hanif MA. Studies on chemical composition and nutritive evaluation of wild edible mushrooms. JICS 2008;27:151-4. Gonaus C, Kittl R, Sygmund C, Haltrich D, Peterbauer C. Transcription analysis of pyranose dehydrogenase from the basidiomycete Agaricus bisporus and characterization of the recombinantly expressed enzyme. Protein Expr Purif 2016;119:36-44. Atkins FC. Guide to Mushroom Growing. London: Faber and Faber; 1974. p. 122. Kerrigan RW. Global genetic resources for Agaricus breeding and cultivation. Can J Bot 1995;73:973-9. Jeong SC, Koyyalamudi SR, Jeong YT, Song CH, Pang G. Macrophage immunomodulating and antitumor activities of polysaccharides isolated from Agaricus bisporus white button mushrooms. J Med Food 2012;15:58-65. Varo P, Lahelman O, Nuurtamo M, Saari E, Koivistoinen P. Mineral element composition of finish food. VII postal, vegetables, fruits, berries, nuts and mushrooms. Acta Agric 1980;22:107-13. Available from: http://www.healthblog247.com/some-benefits-of- agaricus-bisporus-extract/. [Last assessed on 2017 Dec 25]. Available from: http://www.undergroundhealthreporter.com/mushroom -health-benefits-cancer/. [Last assessed on 2017 Dec 25]. Prasad S, Rathore H, Sharma S. Medicinal mushrooms as a source of novel functional food. IJFS 2015;4:221-5. Bahl N. Medicinal Value of Edible Fungi. In: Proceeding of the International Conference on Science and Cultivation Technology of Edible Fungi. Indian Mushroom Science II; 1983. p. 203-9. King TA. Mushrooms, the ultimate health food but little research in U. S to prove it. Mushroom News 1993;41:29-46. Imbach EJ. Pilzflora des kantons luzern und der angrenzen innerschweiz. Mitt Naturforsch Ges Luzern 1946;15:5-85. Available from: http://www.gbif.org/species/5243447/synonyms. [Last assessed on 2017 Dec 25]. Chang ST, Miles PG. Mushrooms Cultivation, Nutritional Value, Medicinal Effect and Enviromental Impact. 2nd ed. USA: CRC Press LLC; 2004. p. 59. Spencer DM. The mushroom – Its history and importance. In: Flegg PB, Spencer DM, Wood DA, editors. The Biology and Technology of the Cultivated Mushroom. New York: John Wiley and Sons; 1985. p. 1-8. Genders R. Mushroom Growing for Everyone. London: Faber; 1969. p. 19. Genders R. Mushroom Growing for Everyone. London: Faber; 1969. p. 18.
de Andrade MC, de Jesus JP, Vieira FR, Viana SR, Spoto MH, de Almeida Minhoni MT, et al. Dynamics of the chemical composition and productivity of composts for the cultivation of Agaricus bisporus strains. Braz J Microbiol 2013;44:1139-46. Alkaisi MR, Hasan AA, Aljuboori AW. Evaluation of production efficiency for some cultivated mushroom strains Agaricus bisporus which was renovated mother culture in multiple methods. Iraqi J Sci 2016;57:383-90. Rehman MK, Ali MA, Hussain A, Khan WA, Khan AM. 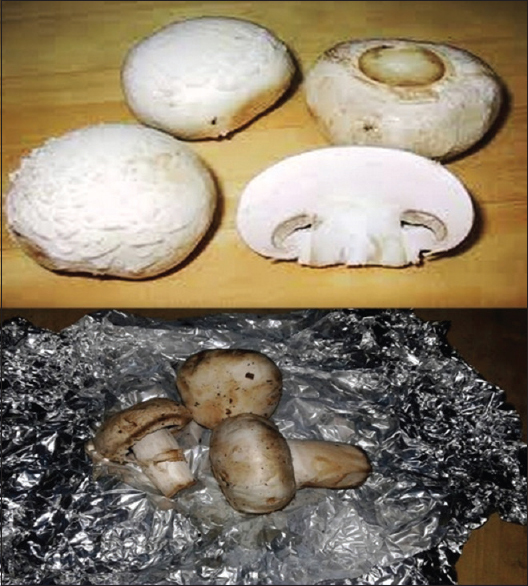 Effect of different casing materials on the production of button mushroom (Agaricus bisporus L.). J Environ Agric Sci 2016;7:55-61. Baysal E, Yigitbasi ON, Colak M, Toker H, Simsek H, Yilmaz F. Cultivation of Agaricus bisporus on some compost formulas and locally available casing materials. Part 1: Wheat straw based compost formulas and locally available casing materials. Afr J Biotechnol 2007;6:2225-30. Simsek H, Baysal E, Colak M, Toker H, Yilmaz F. Yield response of mushroom (Agaricus bisporus) on wheat straw and waste tea leaves based composts using supplements of some locally available peats and their mixture with some secondary casing materials. Afr J Biotechnol 2008;7:88-94. Muslat MM, Al-Assaffii IA, Alheeti MN. Use efficiency of reed residues Phragmites australis with amendment by streptomyces o3 to prepared compost for Agaricus bisporus production and influence of spraying Glycyrrhiza Sp. extracts. Res J Aleppo Univ Agric Sci Ser 2011;93:149-68. Reddy MT, Reddy KA, Reddy KA, Reddi EU, Reddi B. A study on the production of Agaricus bisporus mushrooms using Eichhornia crassipes (mart. Solms) – A troublesome exotic aquatic weed of Kolleru Lake. IJSN 2013;4:100-3. Gülser C, Pekşen A. Using tea waste as a new casing material in mushroom (Agaricus bisporus (L.) sing.) cultivation. Bioresour Technol 2003;88:153-6. Peker H, Baysal E, Yigitbasi ON, Simsek H, Colak M, Toker H. Cultivation of Agaricus bisporus on wheat straw and waste tea leaves based compost formulas using wheat chaff as activator material. Afr J Biotech 2007;6:400-9. Sassine YN, Abdel-Mawgoud AM, Ghora Y, Bohme M. Effect of different mixtures with waste paper as casing soil on the growth and production of mushroom (Agaricus bisporus). Aust J Basic Appl Sci 2007;1:96-104. Sassine YN, Ghora Y, Kharrat M, Bohme M, Abdel-Mawgoud AM. Waste paper as an alternative for casing soil in mushroom (Agaricus bisporus) production. J Appl Sci Res 2005;1:277-84. Sinden JW, Heuser E. The nature of the short composting process and its relation to short composting. Mushroom Sci 1953;2:123-31. Wuest PJ. Compost and the composting technique. Mushroom News 1977;2:11-6. Fermor TR, Grant WD. Degradation of fungal and actinomycetemycelia by Agaricus bisporus. J Gen Microbiol 1985;129:15-22. Overtjins A. The conventional phase II in trays or shelves. Mushroom J 1998;584:15-25. Reed JN, Miles SJ, Butler J. Influence of mushroom strains and population density on the performance of a robotic harvester. J Agric Eng Res 1997;68:215-22. Tillett RD, Batchelor BG. An algorithm for locating mushrooms in a growing bed. Comput Electron Agric 1991;6:191-200. Reed JN, Crook S, He W. Harvesting mushrooms by robot. Mushroom Sci 1995;15:385-91. Reed JN, Miles SJ, Butler J. Automatic mushroom harvester development. J Agric Eng Res 2001;28:15-23. Fukushima M, Nakano M, Morii Y, Ohashi T, Fujiwara Y, Sonoyama K, et al. Hepatic LDL receptor mRNA in rats is increased by dietary mushroom (Agaricus bisporus) fiber and sugar beet fiber. J Nutr 2000;130:2151-6. Koyyalamudi SR, Jeong SC, Cho KY, Pang G. Vitamin B12 is the active corrinoid produced in cultivated white button mushrooms (Agaricus bisporus). J Agric Food Chem 2009;57:6327-33. Koyyalamudi SR, Jeong SC, Song CH, Cho KY, Pang G. Vitamin D2 formation and bioavailability from Agaricus bisporus button mushrooms treated with ultraviolet irradiation. J Agric Food Chem 2009;57:3351-5. Mattila P, Könkö K, Eurola M, Pihlava JM, Astola J, Vahteristo L, et al. Contents of vitamins, mineral elements, and some phenolic compounds in cultivated mushrooms. J Agric Food Chem 2001;49:2343-8. Valverde ME, Hernández-Pérez T, Paredes-López O. Edible mushrooms: Improving human health and promoting quality life. Int J Microbiol 2015;2015:376387. Beaulieu M, D'Aprano MB, Lacroix M. Dose rate effect of gamma irradiation on phenolic compounds, polyphenol oxidase, and browning of mushrooms (Agaricus bisporus). J Agric Food Chem 1999;47:2537-43. Espin JC, Jolivet S, Overeem A. Agaritine from Agaricus bisporus is capable of preventing melanin formation. Phytochemistry 1999;50:555-63. Abou-Heilah AN, Kasionalsim MY, Khaliel AS. Chemical composition of the fruiting bodies of Agaricus bisporus. Int J Exp Bot 1987;47:64-8. Anderson EE, Fellers CR. The food value of mushrooms (Agaricus campestris). J Am Soc Hortic Sci 1942;41:301. Nanba H. Maitake mushroom the king mushroom. Mushroom News 1993;41:22-5. Zheng R, Jie S, Hanchuan D, Moucheng W. Characterization and immunomodulating activities of polysaccharide from Lentinus edodes. 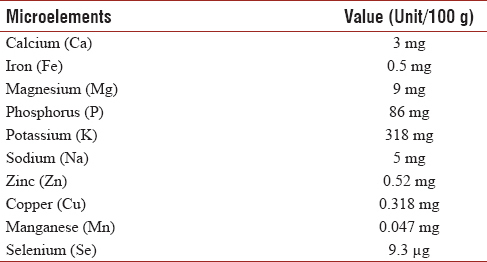 Int Immunopharmacol 2005;5:811-20. Chen S, Oh SR, Phung S, Hur G, Ye JJ, Kwok SL, et al. Anti-aromatase activity of phytochemicals in white button mushrooms (Agaricus bisporus). Cancer Res 2006;66:12026-34. Jeong SC, Jeong YT, Yang BK, Islam R, Koyyalamudi SR, Pang G, et al. White button mushroom (Agaricus bisporus) lowers blood glucose and cholesterol levels in diabetic and hypercholesterolemic rats. Nutr Res 2010;30:49-56. Moro C, Palacios I, Lozano M. Anti-inflammatory activity of methanolic extracts from edible mushrooms in LPS activated RAW 264.7 macrophages. Food Chem 2012;130:350-5. Weigand-Heller AJ, Kris-Etherton PM, Beelman RB. The bioavailability of ergothioneine from mushrooms (Agaricus bisporus) and the acute effects on antioxidant capacity and biomarkers of inflammation. Prev Med 2012;54 Suppl:S75-8. Ren Z, Guo Z, Meydani SN, Wu D. White button mushroom enhances maturation of bone marrow-derived dendritic cells and their antigen presenting function in mice. J Nutr 2008;138:544-50. 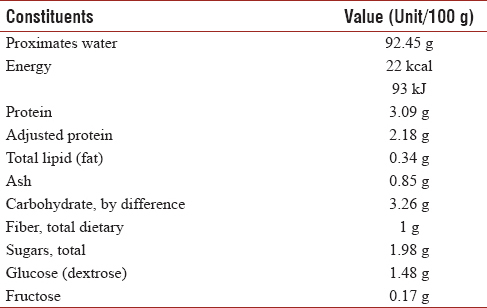 Bożena M, Katarzyna K, Jacek R, Agata G, Opoka W. Composition and biological properties of Agaricus bisporus fruiting bodies – A review. Pol J Food Nutr Sci 2017;67:173-81. Kawakami S, Araki T, Ohba K, Sasaki K, Kamada T, Shimada K, et al. Comparison of the effect of two types of whole mushroom (Agaricus bisporus) powders on intestinal fermentation in rats. Biosci Biotechnol Biochem 2016;80:2001-6. Zaidi KU, Ali SA, Ali AS. Effect of purified mushroom tyrosinase on melanin content and melanogenic protein expression. Biotechnol Res Int 2016;2016:9706214. Komura DL, Carbonero ER, Gracher AH, Baggio CH, Freitas CS, Marcon R, et al. Structure of Agaricus Spp. Fucogalactans and their anti-inflammatory and antinociceptive properties. Bioresour Technol 2010;101:6192-9. Waithaka PN, Gathuru EM, Githaiga BM. Antimicrobial activity of mushroom (Agaricus Bisporus) and fungal (Trametes Gibbosa) extracts from mushrooms and fungi of Egerton main campus, Njoro Kenya. J Biomedical Sci 2017;6:3. Owaid MN, Ibraheem IJ. Mycosynthesis of nanoparticles using edible and medicinal mushrooms. Eur J Nanomed 2017;9:5-23. Eskandari NM, Jafarizadeh MH, Rahbar SJ. Hydrothermal green synthesis of gold nanoparticles using mushroom (Agaricus bisporus) extract: Physicochemical characteristics and antifungal activity studies. Green Process Synth 2017;7:38-47. Majumder P. Nanoparticle-assisted herbal synergism an effective therapeutic approach for the targeted treatment of breast cancer: A novel prospective. Glob J Nanomed 2017;2:555-95. Kabel MA, Jurak E, Mäkelä MR, de Vries RP. Occurrence and function of enzymes for lignocellulose degradation in commercial Agaricus bisporus cultivation. Appl Microbiol Biotechnol 2017;101:4363-9.